On November 20, 2014, the Alliance hosted a briefing in Washington, DC to discuss the policy, practice, and system changes that have resulted in better care and outcomes for underserved, vulnerable populations in the Alliance sites. Listen to a recording of the event and download the presentation slides here. November Webinar Recording & Slides Now Available! 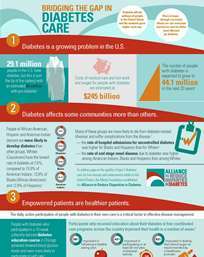 A recording of the Alliance's webinar, "Promising Innovations to Address Diabetes in Vulnerable Populations: Local Solutions With National Implications," held on Thursday, November 6, 2014 is now available online here. The presentation slides are also available to download at that link. 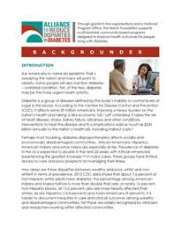 This webinar featured work published in the November 2014 Health Promotion Practice (HPP) supplement on the Alliance to Reduce Disparities in Diabetes, published by the Society for Public Health Education (SOPHE). Results from the Alliance to Reduce Disparities in Diabetes have been published in the November 2014 supplemental issue of Health Promotion Practice. The issue features ten manuscripts authored by members of the Alliance program sites and the National Program Office. All of the articles are available here. A podcast with HPP supplement co-guest editor Tawara Goode, Director of the National Center for Cultural Competence and Associate Director of the Georgetown University Center for Child & Human Development, is also available. Listen here. A new Alliance report, Policy Considerations That Make the Link: Connecting Community Experience and National Policy to Reduce Disparities in Diabetes, poses a series of policy considerations for reducing disparities in diabetes in the new era of Health Reform. These considerations derive from the on-the-ground experiences of the five Alliance sites, along with deliberations among academic, government, consumer and provider experts convened at a recent national summit. The considerations pose a series of questions surrounding the identified need to realign financial incentives affecting health systems, providers and patients as a mechanism for reducing disparities in diabetes. Improving Diabetes Care and Outcomes on the South Side of Chicago aims to reduce diabetes disparities in Chicago's South Side while taking into account the region's marketplace, socioeconomic challenges, and history of racial mistrust. The intervention incorporates culturally tailored patient activation, cultural competency training for clinicians, clinic redesign with patient advocates, nurse care management, and enhanced community partnerships and resources. The intervention will also increase the number of persons with diabetes from underserved populations who access comprehensive care. The Camden Citywide Diabetes Collaborative seeks to fundamentally change how providers, office staff and community agencies in Camden care for city residents with diabetes by building an accessible, high-quality, coordinated and data-driven health care delivery system with a strong primary care base. The specific goals of the program are to improve the capacity of community-based, primary care practices to provide comprehensive, proactive care to their patients with diabetes; improve diabetes self-management for the residents of Camden; increase the capacity of medical day programs to care for their patients with diabetes; and improve coordination of care for people living with diabetes across the city of Camden. As a not-for-profit health care provider in north Texas, Baylor Health Care System has made a system-wide commitment to improving equity in health care access, health care delivery and health outcomes. The Diabetes Equity Project extends the BHCS commitment to health equity by working to improve both access to and quality of care delivered to low-income, minority, uninsured and underserved people with diabetes who reside in Dallas County, Texas. This program aims to create and support a comprehensive, community health system partnership to improve outcomes for American Indian people with diabetes and to reduce the substantial health disparities experienced by American Indians. The program encompasses individuals, providers and the overall health system to assist individuals in making lifestyle changes, increase the effectiveness of communications between health care providers and patients, and extend and increase resources through improved coordination and collaboration among diabetes services at the Tribal, federal and state levels. Common Table Health Alliance (formerly Healthy Memphis Common Table) is a regional health improvement collaborative of community organizations, coalitions and individuals dedicated to improving the health of people in the greater Memphis area. The goals are to address issues related to health care disparities through its Diabetes for Life (DFL) initiative by implementing a proven, evidence-based chronic disease self-management program that can be offered to people with diabetes as part of a comprehensive approach to diabetes management and care.